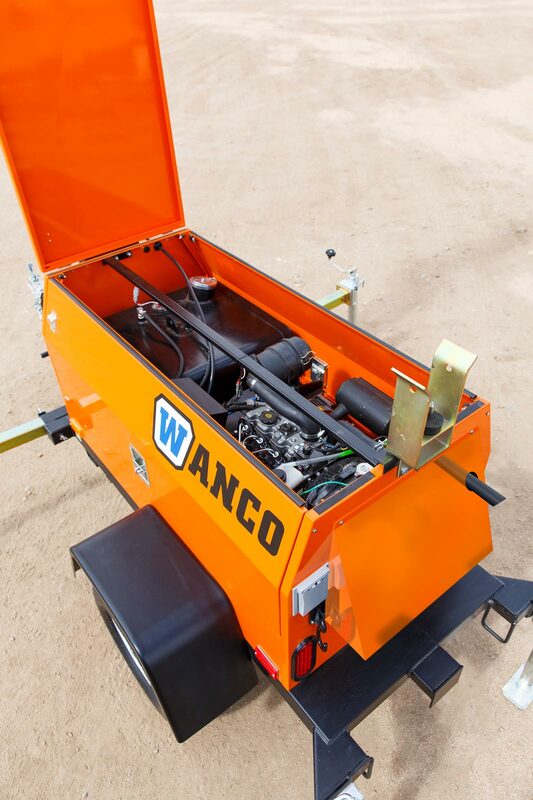 Long-Run Light Towers - Wanco Inc.
Wanco Long-Run Light Towers feature an exclusive, revolutionary design that provides more light than a metal halide light tower, but uses far less fuel. Four powerful LED light fixtures provide emulated daylight across a wide field, lighting the entire work area. With plenty of power-saving technology, including a premium-grade Perkins engine, run times exceed 225 hours before refueling. There has never been a light tower like this. LED technology effectively replaces outdated HID flood lights. By design, LEDs have a more controlled, highly directional light distribution, focusing light rather than sending it in all directions. The result is more efficient use of light energy and much lower power consumption. 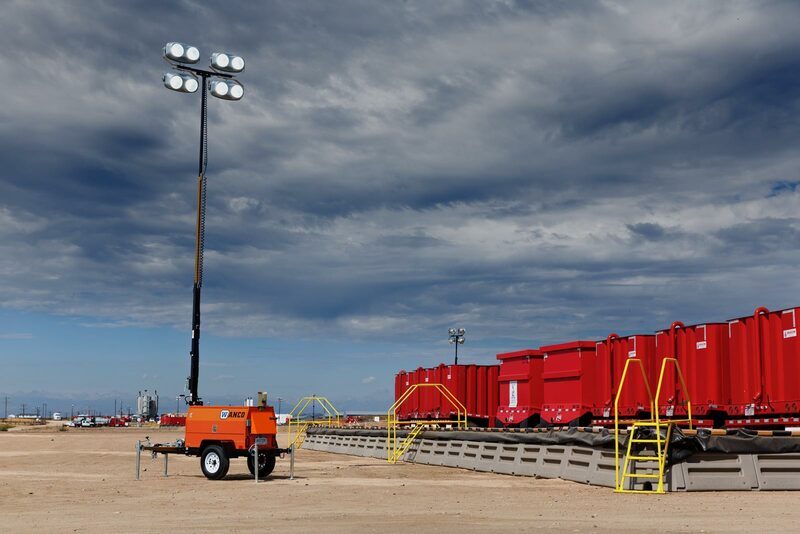 Wanco Long-Run Light Towers optimize the benefits of LED technology for brilliant illumination and extraordinary fuel savings. 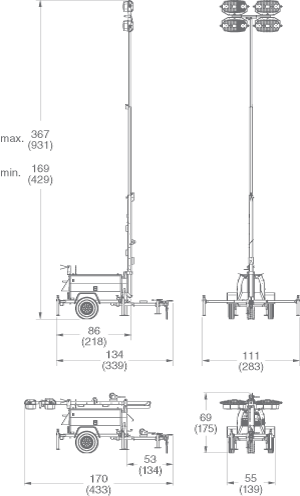 The telescoping tower assembly is compact when stored, yet rises to 30 feet when deployed. Two winches raise and extend the mast easily. Power- and hand-operated winches are available. In the upright position, the light tower mast rotates 360 degrees, and each light can be aimed individually. The lights can operate at any height. The power system features a rugged Tier 4 diesel engine and high-quality two-pole generator. An extra-large fuel tank provides extended run times of 225 hours or more between refuelings. An electric fuel gauge provides an instant read of fuel level, and is lighted for easy viewing at night. Exceptional power efficiency and fuel savings create a smaller carbon footprint than other light towers. Low fuel consumption not only lengthens run times, it greatly reduces refueling and maintenance costs. Additionally, built-in fluid containment protects against ground contamination from leaks, spills and drips. Wanco created a unique innovation that greatly improves serviceability. 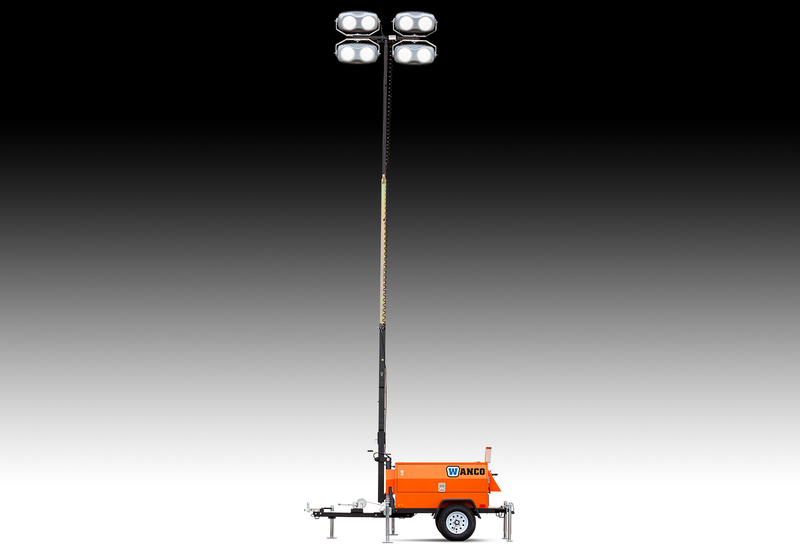 For complete access to the engine, generator and electrical components, Long-Run Light Towers feature a hinged top panel that rises with the mast when maintenance is required. No other light tower makes engine access this easy. Gull-wing side doors may be opened while the maintenance panel is raised, further enhancing access. 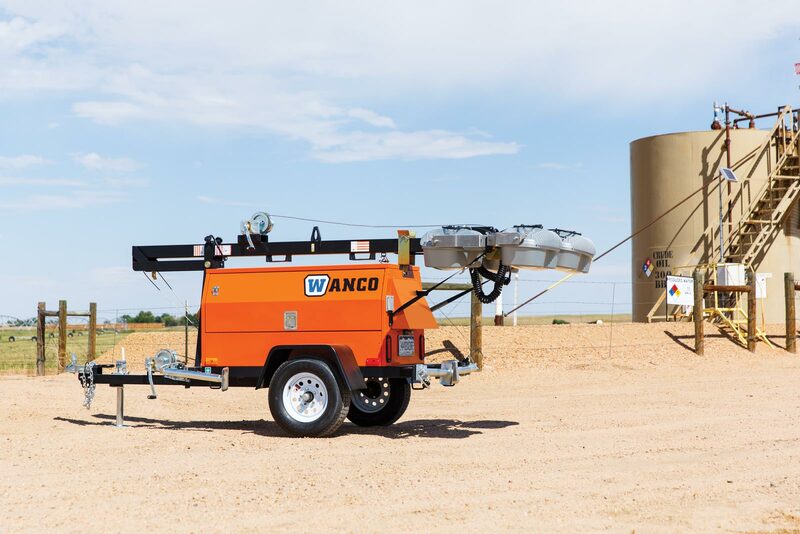 Wanco Long-Run Light Towers can be enhanced for specific applications with a wide selection of options: a flashing beacon indicates low fuel and activation of the fluid containment system; an electric fan with sensor-controlled operation keeps the engine running in extreme temperatures; automatic engine controls provide autonomous operation for remote locations; and many more options are available to suit your application.